After its Best Newcomer win at The Journal Culture Awards last year, Moving Parts 2019 was destined to be spectacular. Moving Parts is Newcastle’s puppetry festival, and this year’s line-up follows on from its sell-out programme in 2017 with spellbinding UK premieres, international performances, films, live music, and plenty of interactive masterclasses from Greece, Germany, and The Netherlands. I’m the festival’s Writer in Residence and lucky enough to be attending all the evening shows. It’s set to be a rollercoaster week of giant interactive performances, puppet Olympics, wonderfully creepy theatrical shows (in some cases with particularly tragi-comic clowns), and finally a blowout party at the end with a science fiction-punk-rock-hybrid of a band. What more could any writer ask for? The festival kicked off on Saturday and Sunday with interactive giant puppets on Northumberland Street – imagine Poe-inspired ‘secret-keeper’ magpies, Dolly the Giraffe (which pooped), and a giant dancing puppet and ball-balancing street performer. Monday’s performances began with Giraffe – a show from Greece. The first act told the story of a little boy who demands a toy aeroplane, but finds his affection drawn to a toy giraffe. But what then happens when the giraffe turns out to be the money box in which his parents have saved coins for the aeroplane? The second act followed one older man’s imaginary adventures when he discovers the giraffe in a park. Giraffe felt like the perfect start to the festival; this traditional table top performance managed to swoop between comedy, tragedy, drama, and fantasy with seamless effort and had the audience gasping, laughing and standing to cheer at the close. After a drop-in talk in the rehearsal room upstairs with the makers of Giraffe, the audience piled in for the Opening Night Cabaret, billed to be a mixed bag of six puppetry acts hosted by a charismatic circus performer. In quick succession, we were mesmerised by acts as diverse as traditional Rajasthani dancing and live drums, Rex – a bizarre dino-chicken hybrid who believes he’s both terrifying AND a convincing Michael Jackson impersonator, and Count Ocular, an impressively staged Victorian slight-of-hand magician with a difference – he just happens to be a giant eyeball. The second half followed with a hilariously self-aware masque ‘agony aunt’ session (the audience were screaming with laughter), and the deliciously clever Finger Fatale with the sexiest hand dance I’ve ever seen. And finally we met Eric, who spent his performance greedily eating the contents of a carrier bag (and then ultimately himself too). 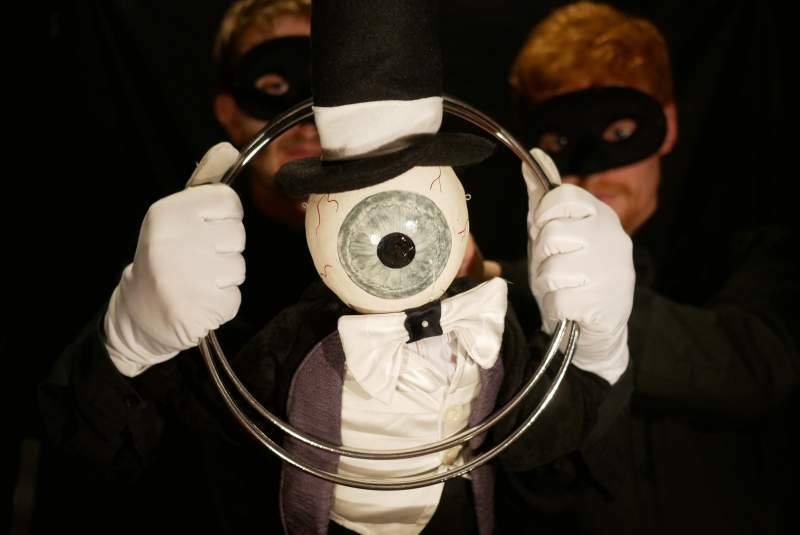 Kudos has to go to the cabaret’s host – who even got into the spirit of things by challenging one audience member to a staring competition with his unblinking and cantankerous hand puppet. On Tuesday I padded along to see Janet, performed by Helenandjohn. Billed as a ‘coming of age story’ with a mix of B-movie horror and Monty Python, I had no idea what to expect from the staging of a bag of flour, metal water canister and silver teapot. But soon after Helenandjohn donned her tissue mask and chef’s hat, the objects (or should I say characters) came to life, and I couldn’t help but see faces in the lump of uncooked dough that played Janet. So far, Moving Parts has shown the diversity of what’s possible in puppetry performance, but there’s still a lot more to come. Most performances are sold out, but there are still tickets for Saturday’s Coulrophobia and the blow-out party with Henge – and I recommend you snap them up while you still can! Caroline will be reporting back on more shows next week.